Roger Ebert is cutting ties with the movie review show that he and Gene Siskel made famous. The producers of Ebert and Roeper have confirmed that they are taking the show in another direction. Ebert's announcement comes one day after Roeper said he was leaving the nationally syndicated show due to an inability to come to an agreement with Disney contractually. 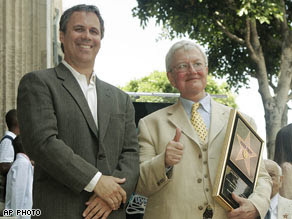 Over the last two years illness has left Ebert voiceless and unable to fulfill the obligations of appearing on the show; however Roeper forged ahead with a variety of co-host. Roeper stated that the show was never the same without Ebert. Ebert and the widow of Gene Siskel retain the trademark to the praise "Two Thumbs Up". Although I did not always agree with their critiques of the movies I enjoyed the banter, especially when the hosts did not agree. The canceling of the show marks an end of an era. The balcony is closed for good. Oh, I didn't hear this...it really is the end of an era. I have Eberts web site linked on my blog because even if I don't agree with him (or do) I always enjoy reading his impressions AFTER I see a film. I think Ebert is a great reviewer because unlike new movie critics...he doesn't give away the plot. Now it seems movie critics are lazy and just tell us the plots. I never read a review anymore before I see a movie. Overall Ebert has very progressive film taste, like the first to recognize the art and magic of Raging Bull, Goodfellas...and many independant off the beaten path movies. I hope he keeps up his website. I am with you on the progressiveness of the critics. I remember Siskel and Ebert giving kudos to films like "Do The Right Thing", "Boys Don't Cry" and many of the independent films that you don't usually hear a lot about. I remember Siskel and Ebert when they were on PBS. In those days, a thumbs up was excedingly rare, and a two thumbs up was even rarer. But Siskel and Ebert had a great chemistry, not so much Ebert and Roeper. X. I miss Siskel too. They did have a rare chemistry and things were never the same when he passed. It's certainly an end to an era. As a kid, I used to watch Siskel and Ebert banter back and forth on "Sneak Previews" every weekend on PBS. Although Roeper was OK, he sometimes seemed as if he was reluctant to disagree with Ebert. It'll be interesting to see how "At the Movies" fares with the new hosts (Ben Lyons and Ben Mankiewicz). The only thing I know about Lyons is that he's the son of Jeffrey Lyons (who incidentally was one of Siskel and Ebert's replacements when they left Sneak Previews in 1982). However, I am familiar with Mankiewicz as the daytime host of TCM. I like the informative and irreverent insights he brings to the films he hosts.